You hear the words “position” or “positioning” in sports a lot—and with good reason. Football coaches talk about the importance of field position and positional matchups in regards to players. Basketball coaches stress being in the right position on defense or to grab a rebound. Auto racers are obsessed with pole position and getting position on the track so they can make a move towards Victory Lane. Boxing, tennis, soccer, it doesn’t really matter what sport you choose, your position is key. Golf is certainly no different. And today, we’re going to talk ball position at address—with all clubs. It all goes back to the basic fundamentals you learned during your very first junior lesson. Grip the club with your hands in the right position, stand with your feet, and the proper ball position at address. Without these basic fundamentals, you simply can’t play good golf. Now you might think, “I learned about those things as a kid and it doesn’t apply now.” Not true. We could all use a refresher course from time-to-time. There could be several reasons why you played poorly during your last round. You might have doomed your round before you swung the club, all because you weren’t lined up properly. Knowing the proper positioning during setup is the key to scoring, and in this article I’m going to walk you through your bag and show you how having the proper set up will help you play better and score better. The human brain desires clarity. Good coaches provide a simple consistent message to create that clarity. Let’s start with the driver since it’s the first club you’re going to grab and a good drive puts you in a position (there’s that word again!) to make par or better. The ideal position for the ball is off your left heel (if you’re right-handed). 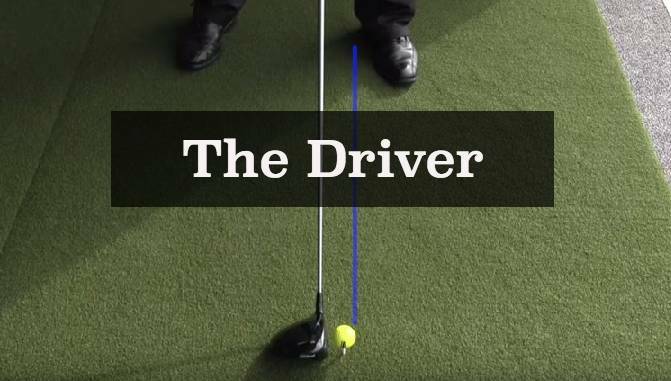 This allows you to make a nice swing and create a positive angle of attack for your drive. By that, I mean you’ll be hitting slightly up on the ball and produce the optimal combination of a high launch angle and low spin. The tendency with most amateurs is to have the ball more in the middle of their stance. This means you’ll be hitting down on the ball and imparting a lot of spin and a lower launch angle. This will rob you of distance and accuracy every single time guaranteed. 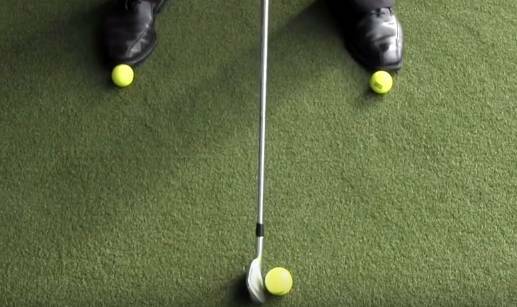 A simple aid you can use is to put two golf balls at the tips of your shoes. Now step back and look at the three balls. If it looks like a perfect triangle, you have the ball too far back in your stance. It should look almost like an “L” and be close to a right angle. Do that and you’ve got the proper setup up to grip it and rip it. When thinking irons, you need to change your thoughts from the driver. Instead of positive angle of attack, we need to apply a negative one. This means hitting down on the ball. Ideally, you will hit the ball first and the turf second. If you find yourself hitting the ball too fat or too thin at times, you need to check the position of the ball in your stance. You want to be hitting down on the ball and trapping it between your club face and the turf. This is a negative angle of attack. 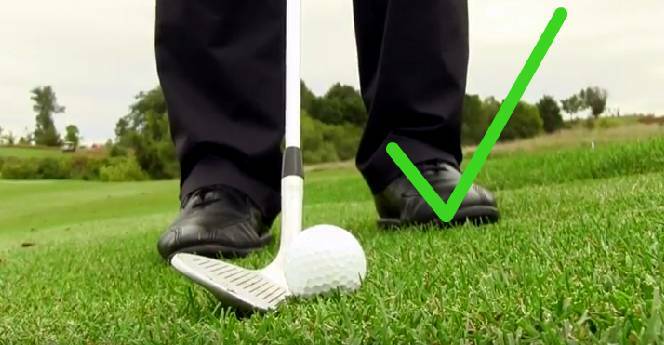 Take the balls from the previous tip with your driver and do the same thing—put them at the tips of your shoes. This time, the balls should form a symmetrical triangle with the ball located in the middle of your stance. If you have the ball off your left heel like you do for the driver, you’re going to be hitting up on the ball and topping it. It doesn’t matter what number iron you’re hitting. There’s a misconception if you’re hitting a 2 or 3-iron you need the ball up in your stance a little more than a 6 or 7-iron. Keep the ball in the middle of the stance to hit down on the ball and make clean contact with all your irons. Clean contact all starts with your ball position with your irons. A ball hit crisply will have a better trajectory and will typically fly much further. Any golfer should be able to feel this difference—it’s amazing! If U can not define why you R having success it will be short lived. Know what allows you to be successful and the success will continue. Around the greens, ball position is equally important so you can chip it close and save par. Let’s assume you’ve got a pretty standard lie, maybe in the fairway just short of the green or just off the fringe. Move the ball a little back into your stance and keep your stance narrow. This isn’t the same stance you would have for a driver or iron shot. Keep the feet pretty close together. Then play the ball off of center and closer to your back foot. A second component to effectively hit this shot is to open your stance a little bit and move your hands just over the ball slightly. The tendency may be to press your hands forward more, but resist this feeling. 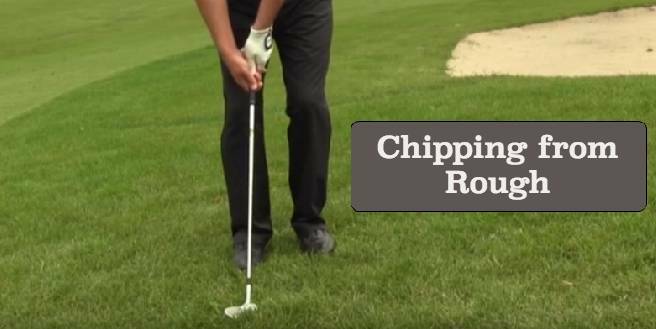 This will deloft the club and make your chip much harder than it needs to be. We want the club to be our friend. Digging the leading edge won’t do us any favors. Doing this will give your swing stability and ensure you’re hitting down on the ball and letting the loft of the club do the work. There is no need to help the ball into the air. That’s what your wedge is designing to do. Now simply make your normal swing and watch your ball cozy up to the flag. The number of strokes you will save with this simple tip will add up quickly during the course of your round. Now, suppose you’ve missed the green a little by a little bit more than a yard or two. Suppose you’re in some pretty nasty rough, too. Not to worry. First thing first, let’s address that ball position. 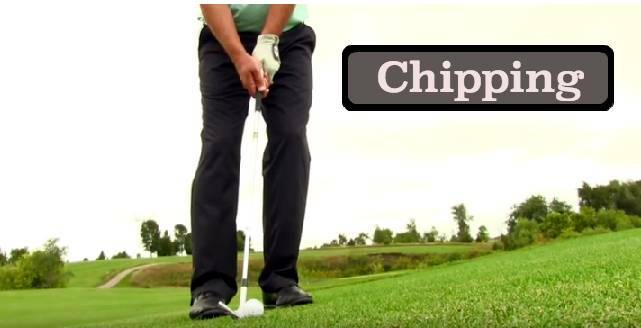 Move the ball back farther in your stance than previously talked about with chip shots. Your right toe should be pointing at the ball (see above photo). The reason is because you need more loft in thicker grass. More loft gets the ball up higher and lets you swing quicker. Now make the same swing as you would from a better lie and finish the swing! Don’t stab at the ball and slam the clubface shut at impact. Be aggressive and confident with your swing. You’ll be pleased with the result. Suppose also you left yourself with a nasty chip shot and need to hit the ball high and have it land soft. Phil Mickelson is a master at hitting perfect flop shots under the most pressure-packed situations. You can be too. 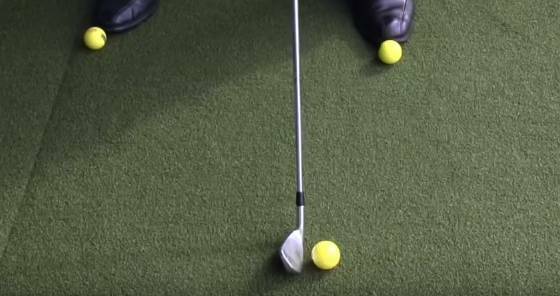 Remember your ball position and take the fear out of the flop shot. You need to deliver more loft to the shot so move the ball towards the middle of your stance. Keep your normal, narrow stance like you would for a regular chip shot but don’t lean your hands too far ahead. Remember, we need loft to execute this shot. Keep your shaft angle neutral and make your normal swing. That’s it. There is no need to be afraid of the flop shot. Ball in the middle of your stance, keep your hands a little back and finish the swing. The ball will pop up high and land soft with minimal roll. Finally, let’s talk about hitting the ball in the wind. 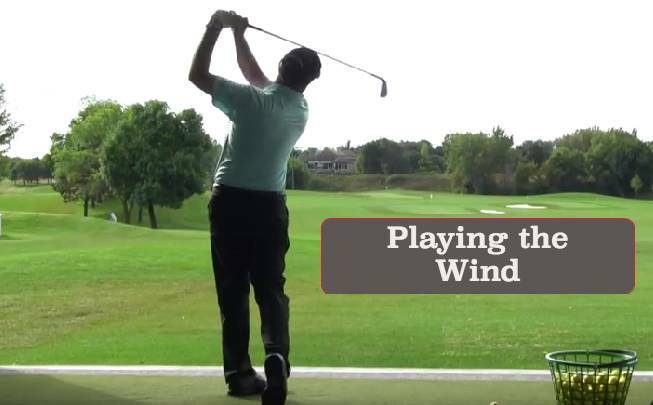 The Scots have a saying “Nae wind, nae golf.” It doesn’t matter if you’re teeing it up at St. Andrews, Florida or Nebraska, you’ve dealt with some windy conditions from time-to-time. Obviously, a high ball flight is going to be problematic on a windy day. So you need to keep the ball low. You might think hitting down on the ball will make it go higher, but that’s not the case. In fact, you need to hit down on the ball MORE to keep it low and out of the wind. To do this, move the ball slightly back in your stance. Earlier when talking about irons, you were told to have the ball in the middle of your stance. That’s true, but to keep it low move the ball back from center, just a touch. Next, push your hands slightly forward. Remember doing this helps to deloft the club even more and will cause you to hit down on the ball more. In this case, that’s a good thing because it will keep your ball flight down. Ideally you want the shaft and clubhead to be working at the same rate, and your finish will be a little shorter with your arms more extended than normal. Your ball flight will be lower and you’ll have more roll on your shots as well. Take some time at the range and practice these shots and make sure you’re in the right position to play the shot in front of you. Each of these concepts will require some time to understand and execute properly, but when done so, you’ll see the improvement. If you want to ask more questions, reach out to our team on Twitter: @usgolftv or @ToddKolbGolf. Pop-up drives, fat irons and chunked or bladed chip shots will be a thing of the past once you make sure your feet and hands are where they need to be. And speaking of position, with these tips you’ll be in a winning position on the golf course. Like most articles we see in media today this is a well constructed and follows a format that delivers a message and uses others as experts to attempt to support their data the , looks good, sounds good, maybe feels good so the content must be good. Well not exactly, it appears the CNN formula being used to manipulate today’s headlines is now being used in sports. 1. ““I learned about those things as a kid and it doesn’t apply now.” – Who says that? Even the kid who rode the pine in baseball knows the fundamentals learned as a kid apply today as it did then, especially the nerdy ones, basic physics do not change when hitting an object putting it into motion. What changes is the person as they grow and develop. A club impacting a ball is just basic ballistics, we may change our perception and understanding but the physics is tried and true as when we were “Kids” and now no matter your age and no mater what CNN thinks they can rewrite history or now appears physics. 2. “To hit a good drive with maximum distance you need two things: a high launch angle and low spin on the ball. ” Not really completely wrong but misleading. What are you considering to be a “high launch angle”? Launch angle is a combination and yes ball position is part of that simple equation. If for example a straight line is drawn horizontally and the driver is placed at “address” and the driver has a 10 degree loft, do we launch at 10 degrees? Typically no, this is determined at point of impact in relation to the swing and position of the ball. We can actually “deloft” the club and launch at a lower angle or play the ball forward and increase the launch angle. Unfortunately the writer doesn’t define what is his “high launch angle” . A better way of saying this would have been “an optimum launch angle to strive for the longest drive no matter the club speed is 12 to 13 degrees” Launch Angle is completely different from the Loft Angle of your club. Or better said Launch Angle is the resultant combination of the degree of loft of your club face combined with ball and hand position at point of impact just to list a few of the variables in this equation. Based on your statement if someone took it a “gospel” then they would then go out and purchase the “highest degree loft” driver available thinking they would be improving their game when in fact this is but one component in the equation. “http://ww2.odu.edu/~agodunov/teaching/phys420/files/Erlichson.pdf” its basic science but if you filter out the formulas, math and facts their is plain and simple language even a CNN “journalist” can understand. By the way, when you really want to know about ball position just Google Hogan Ball Position, you know Ben Hogan from the generations that won two world wars and we put men on the moon without the internet and we had chalkboards and no air conditioners in the class rooms, you know the generation that did something in life besides “Tweet” or was “Followed on Social Media”. My credentials…just a guy over 50 that hits a long drive, 417 Competition, 460 in a Round, 5.5 degree hitting at a 12-14 degree launch, competition swing speed 135, regular round 110-115 mph. Average round just punch it out there 320-340. In conclusion, rather than use the CNN formula and try to re-write history or in this case change basic physics, just write a a good article on the the tried and true Fundamentals of Golf, which worked when we were kids and now that we are older. By the way, also look at how many Champions did not come out of “Junior Golf” programs just poor kids who could hit a ball with a stick, natural talent, Chi Chi & Jesus Rodriguez greats. Ball Position is but one component in hitting a golf ball its a 3,4,5 Dimensional effort and you are only at 1D. But hey it is what we have come to expect from the geniuses that try to being us their opinions in the headlines everyday, hour and minute. Thanks for your long and thought out response to our Ultimate Guide to Ball Position at Address. There is no question you have a strong passion and knowledge of the game. A few points to ponder. Our reference to the comment “I learned those things as a kid and it doesn’t apply to me now” is a comment we hear from time to time on the lesson tee. We, much like you, do not necessarily agree with that belief and therefore felt it was worth addressing in the article. Also, we are well aware there is no one standard launch and spin that will maximize distance for every player on the planet. This calculation is as individual as the swing the golfer brings to the tee. 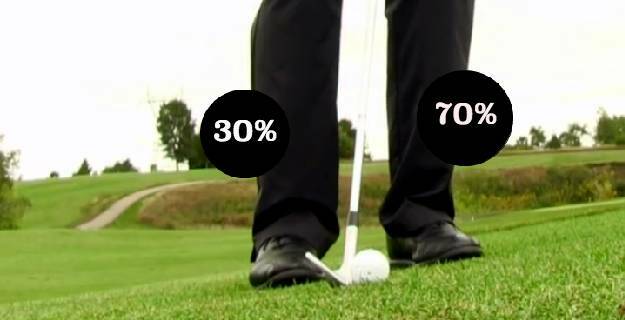 However, our content is geared toward the average golfer who for the vast majority of them launch the ball too low and with too much spin. Our objective is to provide those with some solid information which hopefully gets them thinking and pointed in the right general direction. Thanks again for your remarks and we look forward to having you read more of our articles. Thanks for your response but it appears in an effort to defend the wrong opinions of the original article you forget and actually perpetrate a fallacy. Oh but there really is a standard launch angle to strive for and is confirmed by the science, or “solid information” as you like to call it, in the referenced article is 12-14 degrees, it is up to the golfer to train themselves with the proper degree driver selected based on their swing plane angle of attack to consistently hit at that launch angle and the basic physics takes over, less spin = more ball flight its too simple. With a lower degree loft we are actually launching almost flat with a 1600-1800 rpm spin. All this translates to better ball flight which means better results. Wish I could agree with you but then we’d both be wrong. The comment above was issued by our USGolfTV team, collectively. 1. You speak of the quote we shared. “I learned about those things as a kid and it doesn’t apply now.” This, again, was a quote we hear on the driving range during teaching. It’s not a quote we agree with. You stated you don’t agree either. We worked to address this in the original comment. But if you read closely, you’ll learn that the basic fundamentals and physics are principles we strive to teach with. We hope this clears up your confusion! 2. 12-14 degrees launch is what would be considered “high launch.” Few golfers we see on the lesson tee have too low of spin. This is a general statement aimed at helping high handicap golfers. After doing simple research, and reading the article you shared that highlights your personal achievements, I see you are a long-drive champion. The people looking to achieve increased distance in their games aren’t typically those with REMAX credentials. We understand the article doesn’t offer a complete deep dive into the science, but in an attempt to achieve clarity, we speak in layman’s terms. We understand the optimum launch and spin rates. Our goal with this article was to gain an understanding with ball position. All of the written words stem from the videos provided. Keep hitting the long balls, Jeff, and good luck in your future competition. Thanks for the great comment, Carlos! Good luck in practice.